Before the 2017 season, Major League Baseball shortened the primary disabled list from 15 to 10 days. Teams took advantage, using it more often to avoid the awkward balance between players remaining on the active roster while nursing injuries and a hesitance to miss much time. For now, the sputtering Mets, who overhauled their medical procedures after an injury-plagued 2017, have resisted placing outfielder Yoenis Cespedes, who has a history of leg injuries, on the disabled list despite his hobbled movements on the field. Because Cespedes had not improved since he last played, on Sunday, the Mets sent him for a magnetic resonance imaging examination before Tuesday’s 12-2 win over the Toronto Blue Jays. It revealed a mild strain of Cespedes’s right hip flexor, and he did not appear in Tuesday’s game, which was delayed at the start for nearly 90 minutes because of rain. The reason the Mets had been playing Cespedes of late despite the injury was because they wanted his potent bat in their slumping lineup. But they did not need him on Tuesday. With outfielder Jay Bruce back from the paternity list, the Mets produced their highest scoring output since a 14-run explosion on April 29. The Mets capitalized on the mistakes of Jaime Garcia, the Blue Jays’ struggling starting pitcher. Noah Syndergaard, the Mets’ starter, had driven in both of his team’s runs until a five-run outburst in the fourth inning. Amed Rosario missed a three-run home run by inches, instead settling for a go-ahead run-scoring double, one of his three hits on the night. 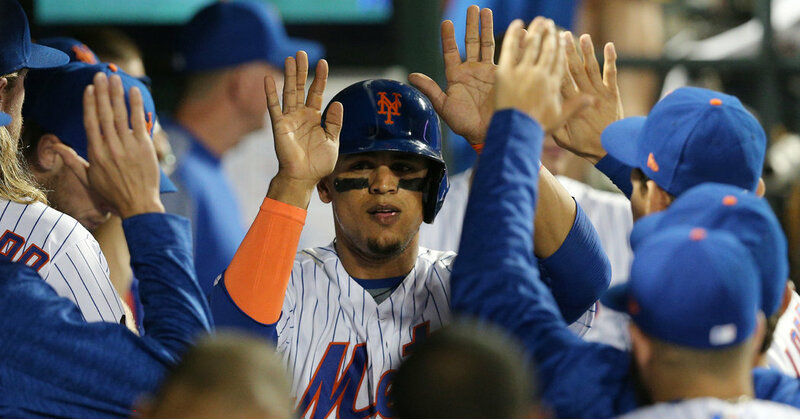 Juan Lagares added a two-run single and Asdrubal Cabrera chipped in with a run-scoring double. It was enough to buoy Syndergaard, who has not pitched quite like himself recently but limited Toronto to two runs over five innings. In the eighth inning, Devin Mesoraco, the catcher the Mets acquired from Cincinnati in a trade for Matt Harvey, added a two-run home run, which was the second time he has gone deep in five games for the Mets. But the theme of the day was a recurring one for Cespedes and the Mets: a leg injury appears, he tries to play through it, and he more often than not ends up on the disabled list later. Alderson said the hip flexor strain was the same injury Cespedes has been dealing with since May 6, when he exited a game early and called it discomfort in his right quadriceps. The hip flexor muscle extends into the front of the leg, hence the variance in terms. Since the initial injury, Cespedes has started four of the Mets’ six games and pinch-hit in another. Yet he moved gingerly and flexed his leg after plays in which he ran hard. Mets Manager Mickey Callaway said he would only use Cespedes as a pinch-hitter on Tuesday if the game was on the line, but that was not an issue in a blowout victory. Had the Mets placed Cespedes on the disabled list late last week, Cespedes could have missed just six games because of three scheduled off-days and a rainout over the weekend. Players often play through nicks and bruises. The Mets third baseman Todd Frazier, for example, dealt with minor hamstring discomfort before it worsened last week and went to the disabled list soon after.